Who does not know about the beauty of nature in a country known for its kiwi fruit? New Zealand is a country rich in natural beauty that can be seen from the box office movies, such as Lord of the Rings and The Last Samurai. New Zealand is one of the English-speaking western countries near Indonesia. A country that is modern and has plenty of beautiful natural attractions. Comfortable and secure learning environment. Stable social and economic conditions. Community and New Zealand culture which is open to foreigners. The high quality and internationally recognized education. Affordable study costs with high quality. Permit to work part time 20 hours per week when during school period and a full time 40 hours during the school holidays. A wide working opportunity for New Zealand graduates. The cost of living like in other places will vary according to the city where people live and the lifestyle of each individual. The average required by each student generally between NZD 1,500 to NZD 1,800 per month. This fee covers the cost of accommodation, meals, and transportation, as well as telecommunications, and other daily necessities. The student visa will be valid for one (1) year and renewed itself every year. Students are allowed to work part time as many as 20 hours per week and full time during semester breaks. Post-study work visa (open) will be awarded to students after completing their studies as much as 12 months to find a study related job. After getting a job, employers can help provide a reference letter so that students can get work visas for two (2) years. As in Australia, international students in New Zealand have a wide selection of accommodation such as boarding schools; rent an apartment until the selection of the homestay. At this time, full-time students can work part time 20 hours per week during term time and full-time work 40 hours during the holiday period. Even after graduation, international students are still allowed to work for one (1) year. Before doing part time work, students are required to obtain a permit from the immigration office in New Zealand, where no fees are required to obtain it. The salary earned during odd jobs around NZD 10 – NZD 15 per hour. As one of the Commonwealth countries, New Zealand has the British education system that is recognized in the world. The equality of quality in all educational institutions both public and private is regulated by NZQA, part of the Ministry of Education. NZQA has the objective to develop and ensure the quality of educational programs organized by the school teacher, polytechnics, institutes of technology, and other educational institutions, except universities. The elementary school in New Zealand starting from the age of five (5) years. Their academic year begins in January and ends in December. In general, the length of primary and secondary education in New Zealand is 13 years. 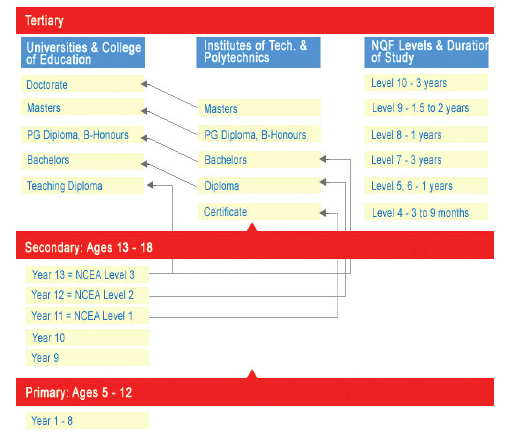 Primary School until year 8, then Secondary School until year 13. Compulsory education in New Zealand is up to year 10. After year 10, students may continue to Diploma to master certain skills. After students enter Secondary School and complete the study, they will obtain the NCEA (National Certificate of Educational Achievement) qualification, which is recognized throughout New Zealand. As mentioned previously, the student can continue to take education and training after year 10. They may take the Certificate, Diploma or Bachelor Degree in Technology and Polytechnic Institute in New Zealand. The programs offered emphasize on experience and practical application in work situations, such as agriculture, art and design, building and construction, media studies, hospitality and tourism. All are developed based on cooperation with the advisory group representing the industry, so the program is relevant, up to date and innovative. This vocational education graduates acquire equal status with university degrees. Polytechnic Institute of Technology & fees ranged between NZD 16,000 – NZD 20,000 per year. New Zealand has eight (8) universities that offer an attractive learning environment and high-quality qualification, ranging from Bachelor level courses to PhD in the academic and professional studies. These eight (8) universities are spread throughout New Zealand. University located in the North Island is University of Auckland, Auckland University of Technology (AUT), the University of Waikato, Massey University and Victoria University. The ones located on the South Island are the University of Canterbury in Christchurch, Lincoln University is also in the city of Christchurch, and the University of Otago in Dunedin. Tuition at the university level Undergraduate / Bachelor usually ranges from NZD 27,000 – NZD 40,000 per year (depending on the major you take); whereas for the level Postgraduate / Master around NZD 31,000 – NZD 40,000 per year. As for Doctor of Philosophy (PhD), the international student tuition fee is the same as for locals or around NZD 6,000 – NZD 7,000 per year. 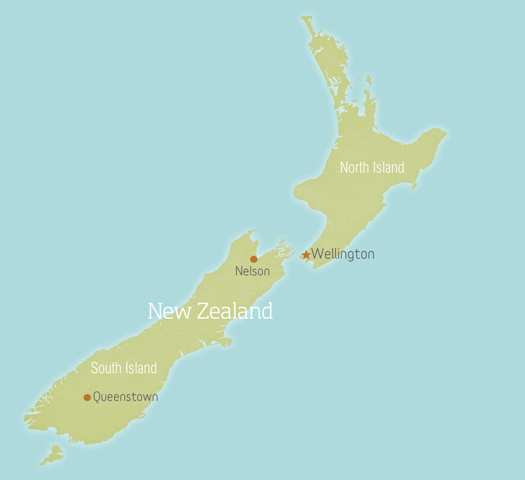 Located in the southeast than the continent of Australia, New Zealand is a country town that consists of two (2) large islands of North and South Island. This British Commonwealth country also has dozens of major islands. The area of this country is about 268,021 km2. The two (2) time zones are owned by this famous-for-the-sheep state. Daylight Saving Time happens during summer since the last week of September until the first week of April, and affects the adjustment of the time to be one (1) hour earlier. 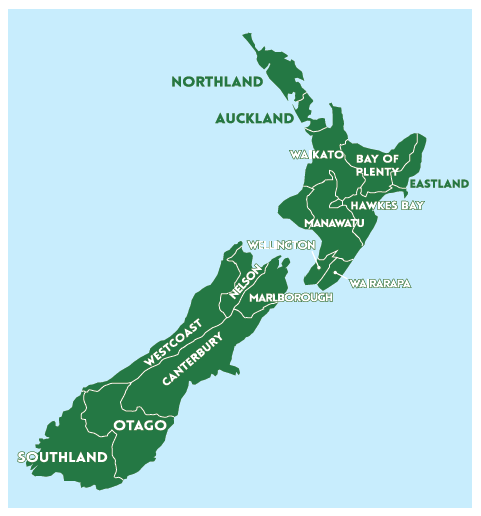 New Zealand population is more than four (4) millions people. Most of them are of European descendants, followed by the Maori. The national language used in this friendly country is English. However, as the native of New Zealand, the Maoris also have a significant role in the country. Maori language is a second language after English in the country of New Zealand. Pilihan transportasi di Selandia Baru sangat bervariasi, dari kendaraan pribadi, transportasi umum (bis dan kereta) hingga kapal feri antar pulau. Transportasi di dalam kota pada umumnya menggunakan bis. Ongkos bis berkisar dari NZD 1.5 – NZD 3 per sektor. Untuk perjalanan jarak jauh dari satu kota ke kota lain masyarakat lebih banyak menggunakan kereta api. Kapal feri banyak digunakan untuk perjalanan antar pulau di utara dan pulau di selatan. Perjalanan antar pulau juga bisa menggunakan maskapai penerbangan mereka yaitu New Zealand Air. Pemegang visa pelajar diizinkan untuk mengendarai kendaraan di Selandia Baru dengan menggunakan SIM Internasional atau SIM Indonesia selama 12 bulan sejak kedatangannya. Namun SIM Indonesia tersebut harus merupakan SIM yang masih berlaku dan harus diterjemahkan ke dalam bahasa Inggris terlebih dahulu. Setelah melewati masa 12 bulan tersebut, pelajar internasional di Selandia Baru wajib mengajukan New Zealand driving license yang dapat diperoleh setelah mengikuti tes tertulis mengenai peraturan di jalan raya dan melengkapi persyaratan lainnya. The New Zealand government runs a constitutional monarchy with a parliamentary democracy, headed by a Governor-General and the Prime Minister; as two (2) representatives of the Queen of England. Mythology says that the North and South Island in New Zealand come from the time of Maui, which is referred to as a demigod. Auckland and Hamilton are the two major cities in the North Island that got the name from Maori language as Te Ika-a-Maui, which means fish of Maui. For the South Island, its Maori name is Te Wai Pounamu which means Water from a Green Rock. The island where city of Christchurch is located is also one of the 12th largest islands in the world. South Island has less population than the North Island, but it has a lot of tourist destinations, be it for winter sports, nature reserves and forest parks, to the natural wealth such as glaze, lakes, volcanoes and also a variety of birds and whales. Rotorua is a town on the southern edge of Lake Rotorua in the area of Bay of Plenty on the North Island, which is famous for geothermal activity. There are many well-known geysers and hot mud pools in the city. In addition, there are also the botanic gardens and historic architecture. A city that offers a natural spa also won the award as the most beautiful city in New Zealand for five (5) times, the last record was in 2009. In addition, the largest tertiary institute outside the university center was located in this city, which is Waiariki Institute of Technology. Largest urban area and the most populous in the country with a population of 1.3549 million, or 31 percent of the total New Zealand population. Auckland also has the largest Polynesian population of any city in the world. It is one of the few cities in the world that has a port on the two (2) separate from the main body of water. Kiwi is not just the fruit, but the original name of the animal which comes from New Zealand, the shape of this animal resembles kiwifruit as we know. Interestingly, the New Zealanders are also being called Kiwi ! So, be careful, don’t get them mixed, ok.
New Zealand is one of three (3) countries with two (2) official national anthems. The first is “God Save the Queen” (the British national anthem) and the other is “God Defend New Zealand”. New Zealand is the first country to have three (3) top positions of power dominated by women simultaneously: Prime Minister (Helen Clark), the Governor General (Dame Silvia Cartwright), and Chairman of the Federal Court of Justice (Sian Elias). Queen Elizabeth II as the Queen in the UK is the official queen of New Zealand. She is represented in New Zealand by the Governor-General, to ratify all laws laid before he was selected by the New Zealand parliament. New Zealand is the first major country that has universal suffrage. In 1893, New Zealand made a law for all citizens, both men and women from New Zealand to have the right to choose. The first commercial Bungee Jumping in the world took place in Auckland, New Zealand in 1986. Study In New Zealand. Starts here. Fill in form below. Our staff will reach you back.